Granted these are two totally different bands on opposite ends of the rock spectrum: Led Zeppelin, the epitome of hard/arena rock music, and the Velvet Underground, the godfathers of alternative rock. Yet these two groups do share some things in common as they were also rebels during their time and are still considered influential to this day. Recently two new illustrated books devoted respectively to Zeppelin and the Velvets only add to their aura. Although it has been nearly 30 years since the group officially disbanded after the death of drummer John Bonham, Led Zeppelin still captures the imagination and interest of rock fans everywhere – one could look at the 2007 one-off reunion show in London as an example of their enduring popularity. Prochnicky and Hulett’s Good Times, Bad Times is a celebration of 40 years of Zep in pictures by various photographers starting from when the group was first known as the New Yardbirds. Page after page features a striking shot of what Zep did best: electrify audiences with their magnetic stage presence, especially in Jimmy Page’s guitar moves and vocalist Robert Plant’s charismatic mannerisms. Augmenting many great live photos from venues, such as Madison Square Garden and the Oakland Coliseum, are some candid shots of a band that valued their privacy — like John Paul Jones spending time with his family and John Bonham strumming on a guitar. There’s also some interesting photographs of Page and Naked Lunch author William S. Burroughs sitting together, and Plant holding a dove in one hand and a beer bottle in the other onstage. The book concludes with a photograph of the surviving members at the aforementioned 2007 show. A foreword by Anthony DeCurtis frames Zep in a historical context and their legacy. 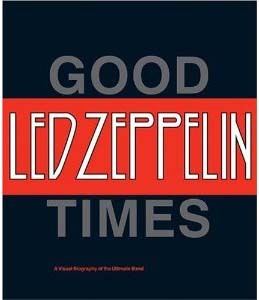 While it’s only a photo book, Good Times, Bad Times still leaves a deafening impact as if you were leaving a Zep show in their heyday. While Good Times Bad Times focuses on Led Zeppelin’s history mainly through photographs, The Velvet Underground: New York Art: tells the story of the New York City alt-rock group through interviews, articles, flyers and mementos in addition to pictures (Note: this book only goes up to the end of the band in the early ‘70s and does not reference the early ‘90s reunion in photos). For those who particularly enjoy the Andy Warhol/Nico phase of the band, this book devotes almost half of its pages to that era. In addition to some wonderful photos of the band on and off stage (i.e. the portraits of the lovely Nico and Lou Reed side by side; Maureen Tucker tossing a football) there are also great artifacts such as posters, Warhol’s famous banana artwork for the first VU album, record company publicity pictures and ads. Interestingly, published clippings of stories and reviews reveal the mindset of the critics at the time, like when the Velvets played at the annual psychiatrists dinner in 1966. 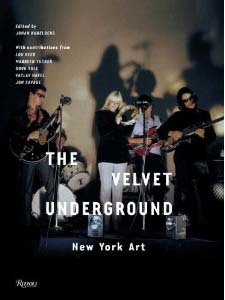 There’s also a lively conversation between Lou Reed and Maureen Tucker about the Velvets for this book and remembrances from the late Sterling Morrison and Doug Yule. This book is a pure delight for any Velvets fan.